Martin: Hello and welcome. It is a little bit sunny today in Wales. But the view I’m about to show is far better. One, it’s got Ted Rubin in it. But two, it’s kind of like, I have to show you now. Look at this. There you go. So we’re going to be talking about return on relationships. And I gave that as context. Quick story, I met Ted very briefly, kind of more in passing at Social Media Marketing World 2014. Reached out to him via Google+ and said I think we should connect further. It would be great to see you. So joined him via hangout. I’ve been watching some of Ted’s videos, some of the interviews, reading up on his background. I saw him on stage with Jay Baer in - I can’t remember who else was there as well. He’s really smart. He’s got a corporate head. And that’s why I wanted to interview him. I’ll bring him on. Hello Ted. Looking a bit sporty. Ted: Thank you very much. You know, I’m down in FL. I’m trying to get, I have family down here. One of my closest best friends from 1976 at Cornell, my roommate. And I stay at his place. And I’m also wearing the hat. It’s a little tribute to my daughter Nikki who is a senior in high school and just got accepted early admission to U of Penn. So the hat is in deference to her and her accomplishments. So I put it on every once inn a while just to feel good about that. I’ll take it off right now so you can see my corporate head as you were just talking about. And of course, this is where I’m at right off the intercoastal waterway in FL and a little bit later this afternoon, I’ll head over and spend a little time by the ocean. Martin: Wonderful. Well I’m going to keep you on the main screen. People don’t need to see me. They know what I look like. Let’s begin. What is your background Ted? For people that don’t know. Ted: I went to Cornell U. After that I got involved in the investment banking world for a number of years. But if you fast forward to the future, on 1997 I was looking for something new. I discovered the internet. I was applying to a whole bunch of different companies. And I read an article, an interview, of Seth Godin, talking about his company Yoyodyne, which was the first online direct marketing company. It was before people really knew who Seth Godin was, before he wrote any of his bestsellers. And I thought he was brilliant. And I loved his thinking and the way he talked about thinking and relationships and companies and this new world of marketing. And at the end of the interview, they asked him if he had new job openings. And his answer was no, I don’t have any official openings, but I’ll always hire somebody smart. And I sat there and said, hey, I’m smart. And I wrote a letter, yes a letter, to Seth and his team along with my résumé. My wife at the time, who is now my ex-wife and has been for many years, of course told me what an idiot I was to bother applying somewhere where they had no job openings. And two weeks ago I got a call. And she called me a little giddy at the office. By the way, cell phones were in their early days. Martin: I remember these days. Ted: We had them, but we didn’t use them all the time. We didn’t have them on all the time. They were very expensive. And she said, oh my God. These people called. And I went up, I met Seth and his team. And it’s a long story. I don’t have to go into the whole thing. It was kind of a funny meeting and an interesting time. And I went to work with him back in 1997. And I was with him when he coined the term permission marketing, which is probably the basis of a lot of the work we do today. And he wrote an article, the book was actually an article first in Fast Company and got rave reviews and became his first bestselling book Permission Marketing. Martin: Well I discovered Seth in 2001 because of Permission Marketing. And it’s influenced me ever since. It’s influenced me on Google+. Ted: Well Seth has influenced me tremendously. I was lucky and unlucky. I mean, the bad mistake I made, most of your audience would know this just intrinsically, I moved up to NY and I had left my wife at the time and my two very young daughters down in FL. One of them was finishing preschool and of course we had to sell the house because we moved to NY. And I made the critical error of moving in with my in-laws. And you just don’t want to ever do that. Especially, I don’t know if you or your audience are Seinfeld fans. Martin: Oh yeah. I know where you’re going with it. Ted: When your in-laws are like the Costanzas, you just don’t want to be there. And what happened was, everything happens for a reason. It caused me to get up very early in the morning and get out of that house before anybody woke up, at like 6 o’clock in the morning. Which got me to the office around 6:30, and the only other one there was Seth. He’s an early riser. He would tend to be in the office walking around. He was holding forth on all his ideas. And I was smart enough to shut up and listen. And I got an education that was probably worth more than any MBA. And I got to spend with a time that is very, very difficult these days to spend time. So I was very fortunate. And I have to tell you, he was very good with his time with everybody in the company there. So it was a great experience. It was kind of the formulation of my thinking about what became a term relationship. And it was the early days of the internet. It was Web 1.0. We got acquired by Yahoo in the 4th quarter of 1998. I got to work with them for a while before I moved on to other pastures. I worked with 1-800-Flowers. I worked with Bottle Rocket, a number of other companies. Which led up to where I am today. I joined a company called El Cosmetics, Eyes and Face.com, 2008, where I got my early experience with social and was fortunate being able to experiment at a company that 1) sold their product to women and make no mistake, social media ceases to exist without women. Men do not communicate that way. We just don’t share like that. We don’t listen to each other. We talk waiting for the other guy. When someone’s talking, we’re not even paying attention. We’re waiting for them to finish so we can say what we want to say. I don’t care how many friends a guy has. He’s not going to take a picture of his shirt, send it to 10 of his friends, wait for them to get back with their opinions, buy the shirt or not, get home and then his bestie sends him a text saying, no that shirt’s not for you, and it has to go back to the store. We just don’t operate that way. Plus I was selling a product like cosmetics, which women just love. I mean, I don’t care who the women are in your audience. Every woman becomes a little girl again when she gets a box of cosmetics. They put it on. They try it. They try different looks. They take pictures. So it was a great place to experiment with social. Plus it was a family-owned business where I had no marketing budget. And I was hired to think of ways to be ingenuitive, to go out and make deals, to create partnerships, and ideas. So social fit in perfectly with what we were doing. And we had no legal team, so I had nobody telling me what I could and couldn’t do. I learned a lot. It was a great experience. Moved on from there to Open Sky, which was another great early social commerce start up, which is still around today with a little bit of a different angle and then on to Collective Bias where it was all about content. So it’s just been a great ride. I left Collective Bias after 3 years, the end of August last year, 2013. 5th largest shareholder, so I’m certainly very, very interested and involved in the space of content marketing and how to create user-generated content at scale about your brand. And now I’m fortunate enough to be working with a number of great start ups, a number of big brands, and speaking around the country and the world. Martin: What an intro! That was just the intro folks. Let’s dive in. I like it Ted. So where do you think are at then in the content marketing world, if we focus on that? And then we can come on to social and talk about the return on relationship as well. We’re in 2015. 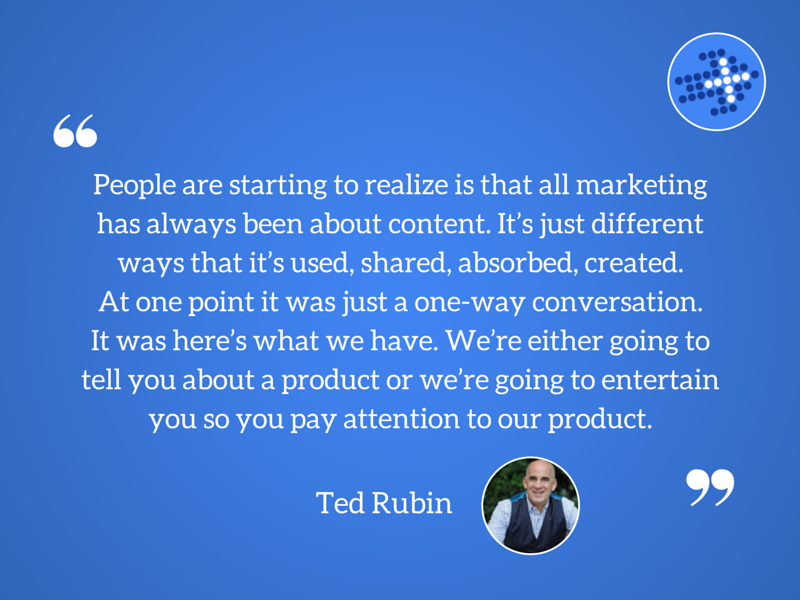 Ted: Well you know what people are starting to realize is that all marketing has always been about content. It’s just different ways that it’s used, shared, absorbed, created. At one point it was just a one-way conversation. It was here’s what we have. We’re either going to tell you about a product or we’re going to entertain you so you pay attention to our product. Now there’s a lot more user engagement. There’s a lot more created by users. People tend to trust their peers much more than they trust an advertiser. So advertisers are trying to wrap their arms around what’s the appropriate mix? Advertising still works. Don’t get me wrong. A great TV commercial, something that is just strictly push, but gets out the message, gets people involved, gets them thinking, still has a huge amount of value. It’s a matter of how you combine it with other things you’re doing, how you allow people to get involved, and then how do you this at scale? And how do you create with that, and then how do you create relationships? Because in my eyes, I see commerce coming full circle now. There was a time where commerce was only with people you knew. It was with the local merchant. He knew you. He knew your family. He knew what your likes and dislikes were. And then it became quite anonymous. With the advent of mass merchandising and the ability for nobody to know who you were. To be anonymous. Everybody jumped into that and they thought it was a great idea. But I think people are realizing now they don’t necessarily want to be anonymous. People and brands and their retailers know who they are. But people don’t necessarily want to be upsold. They want additional value. So now they want to know again. They don’t want you to just use their data to sell them something extra. They want you to use their data to know who they are the way their local merchant knew who they were, who added values to their lives, who gave them products that really meant something to them, who didn’t sell them something just for the extra sale because then he knew it would hurt the long-term relationship, but sold them something that he knew would enhance their life. So obviously there’s a fine line between where’s the upsell, where’s the added value, but I think everyone’s trying to figure it out. And then you throw big data into the mix. And big data I think is an appropriate word. Because it’s so big that most marketers can’t really wrap their arms around it and figure out how to use it properly and figure out what part of it is valuable. And I like to say that you need to take it, file it, and then find the appropriate moment when you can add value to your consumer and make them feel that you’re paying attention, that you’re concerned, and of course there’s nothing wrong with earning money. Everybody understands that’s what a business is there for. But it’s always going to be best if you feel that you’re a part of that, and it’s something that’s valuable to you. So just one quick thing. It’s not necessarily what I see in 2015. It’s what my hope is for 2015. My hope is that people will start using social and actually being social. People are going to want to have friendships instead of thinking a click of a button is a friendships. And that brands are going to start adding value so people are going to feel good about it. And they’re going to be able to break through that commoditization that’s happened with most products. Martin: Let’s talk about channels then. What are your favorite channels? 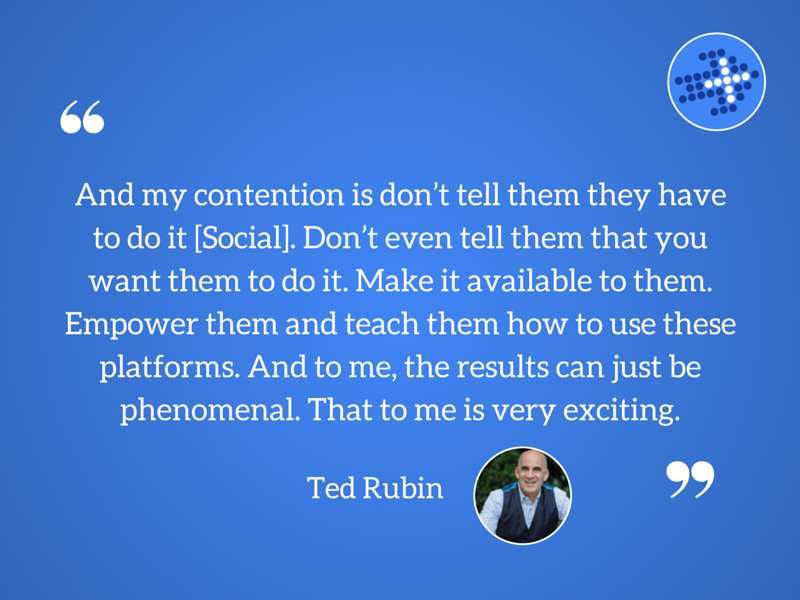 Ted: If you’re talking about me personally, I love the social channels, because an individual as a personal brand, it gives me so much reach. I obviously can’t afford to do TV commercials. I’m not going to buy radio time. I’m not going to buy ads in magazines or newspapers. But to me, this is the age of influence. Where anybody can build a brand, affect change, advocate for brand, make a difference without ever leaving what’s behind me. I could sit here all day. I could go to the beach, as long as it’s not too windy or if I could get a better headset, and I can be doing my job right there. I can be building my brand right there. So I think that’s just a tremendous advantage for everybody. So for me I love Twitter because for me it’s the best place to 1) get real time news, 2) know what’s on people’s minds at the quickest pace, and to network and connect with people as an initial connection. And then I love Facebook. I’ve been getting huge value out of Facebook. And the more they change the algorithms and make it harder for big advertisers to touch people by getting them to follow them, the more value I get out of it because I actually go in there and do the work. I connect with people. I go in there and look at their pages. I see what they’re talking about. I create conversation that’s important to them. So I look them in the eye digitally so they know that I know who they are and what they do. Martin: Let’s talk about relationships. I like that phrase, look them in the eye digitally. I picked up, that was on my list to talk to you about, so I’m glad you brought it up. But let’s talk about return on relationship. What does that mean to you? Can you quantify? Because obviously it’s a play on return on investment, and flip it around, return on relationships. What does it mean? Ted: First of all, what I like to say is sometimes people mistake what I’m saying and think it’s return on relationships versus return on investment. That’s not what I’m saying. I’m saying that if used appropriately, building relationships will create a return that will enhance return on investment, that will make it better. I think what you were getting at a little bit was how do you measure the value. And that really depends on who you are as a person, as a brand, as a company, what’s important to you? Are views important to you? Are impressions important to you? Are shares important to you? Is engagement important to you? And sometime, very often, it’s a combination of all these things. But at some point, if you think of it simply, it’s an extension of your advertising. And sometimes it’s the easiest way for a brand to understand it. So a brand buys impressions, whether it’s magazine ads, newspaper ads, TV, social ads. A social presence. And they pay for those on a CPM basis, cost per thousand with impressions. Well imagine if everybody you’re dealing with, every ad you’re creating, and every conversation you’re having is shared by people in your audience and then shared by people in their audiences. Remember, every audience has an audience. Everybody in an audience has an audience. And everybody has influence with somebody. That’s bringing it down to the real basics of taking your information and being able to spread it out further and deeper than you’ve ever been able to do it before with the impressions you were buying. That’s number one. 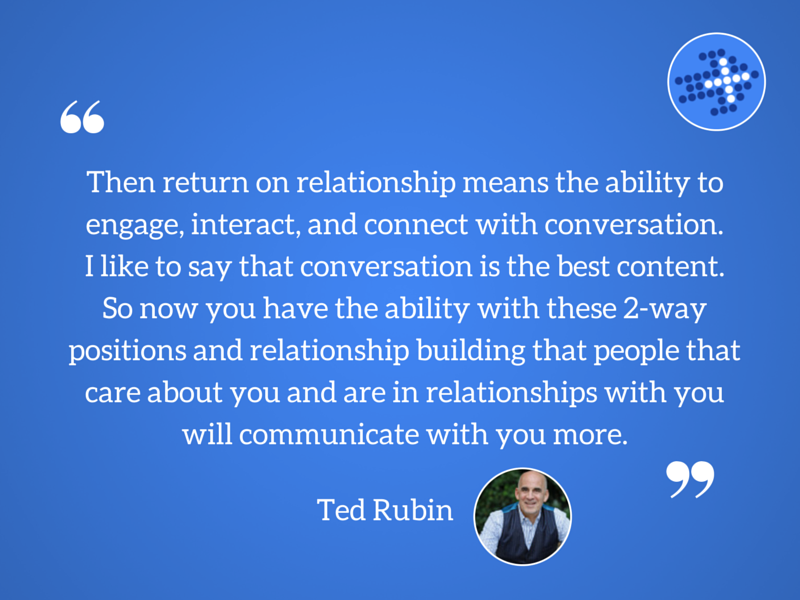 Then return on relationship means the ability to engage, interact, and connect with conversation. I like to say that conversation is the best content. So now you have the ability with these 2-way positions and relationship building that people that care about you and are in relationships with you will communicate with you more. So a lot of it has to do with how they share, how they discuss, and then here’s what I hear a lot of. You can’t scale that conversation. And how can you talk to everybody? And all those people follow you can’t possibly do it. And then you have agencies saying, OMG, more comments. And if there are more people conversing on your page. And I say, I don’t believe that. Because I believe the vast majority of people do what I call participate vicariously. Meaning there are lurkers. They are watching conversations. And they’re listening to those conversations. And when they listen to them, they feel a part of them. That relationship is growing. Just by watching Ted talk to Martin. So let’s say Ted is either a customer service person or a media person or even the CMO of a brand. Let’s say it’s of cosmetics. Let’s say it Estee Lauder. And Lori comes on and has a conversation with me about the makeup she has. People see that I’m answering her questions, engaging with her, having a conversation, and by watching that conversation, by making it public, they feel a part of that conversation. Think about a cocktail party. A lot of people use that as an analogy. But think about it. You go to a cocktail party. There’s a room full of people. There’s usually a few people around the room holding forth with a conversation and they’re each surrounded by a certain number of people, and maybe 1-2 of those people that are surrounding them are interacting or engaging. The rest are just sitting there nodding their heads, patting each other on the back. They feel as much as part of that conversation as the two people that are talking. And when they leave, they thank them Martin, as a friend. They really got to know you. They heard you converse. They heard your opinions. They didn’t just hear one side. They heard somebody else maybe pushing you with a little bit of criticism or maybe adding in to what you were saying. And they felt a part of that conversation. And to me, that’s how the bulk of this scales. You’d be surprised how many people are coming to your page every day that you have no idea they’re there. Now, I was at Collective Bias. I was at a number of companies up until the end of 2013, and so my relationship with people was a certain way. They thought of me as Collective Bias. They reached out to me in a different way. They initially came to me to do work with them. Since then I’ve been traveling around the world. I bump into CEOs, CMOs, VPs, high level people from Fortune 500 companies who look at me. They are not my friend on Facebook. I’m not connected to them in different places. And they know everything I’ve done for the last year. I can’t tell you how many CEOs and CMOs have walked up to me and said things like, that trip you took with your daughter to Costa Rica to learn how to surf. That was amazing. And it was proving a lot of what I was saying and knew to be true. These people are paying attention and you don’t even know you’re there. They feel connected to you when you share. It’s one of the reasons I tell people to open up their Facebook page, to make it available to everybody. There is no line anymore in my opinion between personal and business. Everybody wants to know who you are as a person. They feel much more comfortable doing business with you if they know what kind of a husband you are, what kind of a parent you are, what’s important to you, what’s important in your kids’ lives, do you participate in it? Or maybe not, because that’s important to you. That’s who you are. And I just really believe there’s a lot of value when you share those things. And there’s a lot of value when companies allow their employees to share those things so people know who you are. I hear all the time again that nobody wants to be friends with a company. And I say that’s not true. They may not necessarily want to be friends with a logo. They want to be friends with what the company represents. They want to be friends with the people at the company. Everybody wants to know a guy. I know a guy at Coke. I know a guy in Pepsi. 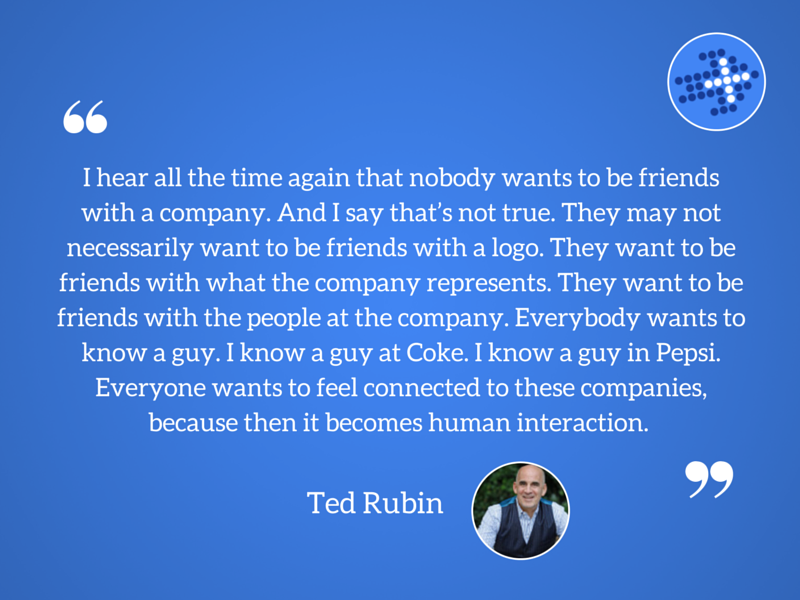 Everyone wants to feel connected to these companies, because then it becomes human interaction. Martin: I love this. This is great. Everybody’s not used to me being so quiet. Right. What challenges are there with this sort of approach? Ted: There’s a lot of challenges. First of all, there’s the companies making this sort of thing happening. There are companies still out there, and you’d be surprised how high a percentage it is, that still block their employees from social media. I’ve been at events where the company is bringing me to speak and a whole bunch of other speakers to encourage their employees to understand the value of social media and then the employees come up to me afterwards and say, do you realize that we cannot get on these platforms at work? I mean, there’s still that disconnect. That’s ridiculous. I mean, remember everybody has a 2nd-3rd-4th screen. I mean, nobody’s not looking under their desk at their iPhone if they’re blocked in their office. Check out the amount of people taking smoking breaks in this country. It’s going up over the last 3-4 years. Do you actually think more people are smoking? No, they’re taking smart phones break. Because they know if they say, hey, I’m going out for a smoke, they can get on their smart phone. You can’t block it. So I think one of the challenges is that fear. That’s number one. So there’s platforms coming out to help with that. I’m on the board of a company called Dynamic Signal. I believe they’re the best employee advocacy program out there. That promotes employee advocacy, that does the compliance, that does the research, that rewards employees, that manages the whole process for companies. And there’s a number of these platforms. And I think this is going to be a big year for that. I think companies are going to realize that their employees can be great advocates for the company. But in order for companies to do that, they’ve got to realize that they’ve got to allow their employees to use social, not just control it. They should really be supporting them in growing their personal brand and influence. Because imagine if you’re a company with 100 or 10K employees. If the average employee had 1K-2K-10K followers on social platform, versus 100, imagine the reach that adds to your company? And every employee wants to brag about their company. They do. The reason most don’t is they’re afraid they’re going to get in trouble for what they say. So what about if you not only empower them to do it but give them content. And another complaint you get from employees, I’d love to build my social presence, but it requires me creating content and sharing things and I just don’t have time for it. Well what about if their company helped them create that content, gave them valuable content to share, not just about their company, but about their industry, about other industries, about things that are important to them like travel, like education, like other things. People are going to be apt to share this and feel good about it. And my contention is don’t tell them they have to do it. Don’t even tell them that you want them to do it. Make it available to them. Empower them and teach them how to use these platforms. And to me, the results can just be phenomenal. That to me is very exciting. And then of course it’s the same thing. Once people get good at this, they’re going to do it as consumers, for other brands, for other people, for things that are important to them. And it’s happening anyway. So why not help people do it? Because they’re going to do it anyway. Your employees are going to talk. They’re going to see their friends. They’re going to share. So why not empower them and tell them that you encourage it? Martin: Next question. Google+ - you know I have to ask about Google+ - where are you at with Google+? 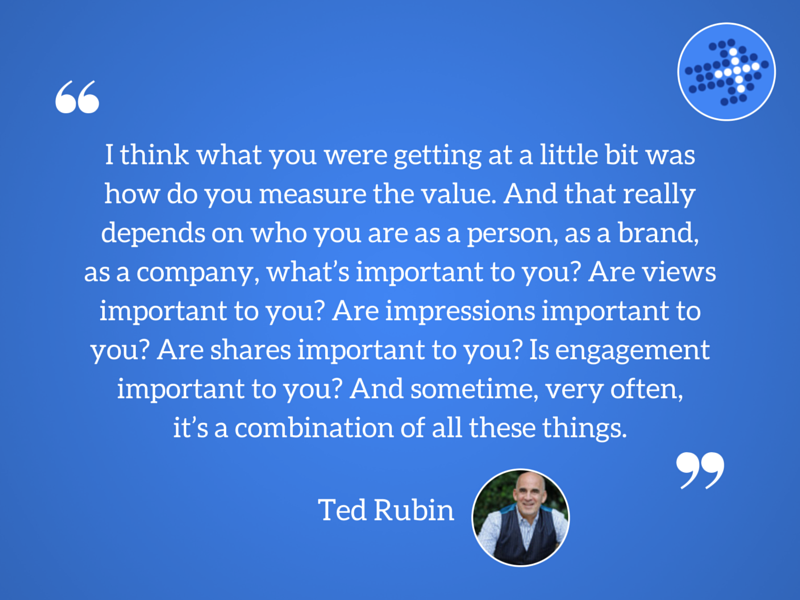 Ted: I don’t see much value in Google+. I’m there because it’s another platform and I tend to get all of them. I also have certain people that follow me on Google+, just like I’m on Tumblr. That’s where they are. That’s where they want to see my content. But for me, Google+ is not a social platform. Google+ is a tools platform. It’s got Google Hangouts, which is awesome. Look, Google’s also gaming the system. So if you don’t publish your content on Google+, you don’t get indexed as well if you don’t +1 your own content, which enables them to say they’ve had 2 visits for every 1 visit. You don’t get as good indexing. So I’m mostly there because it helps index my content. And then because I’ve been there and because I have a Gmail account, so once you have a Gmail account, you’re automatically on Google+, I have certain people that follow me there. Because I do, and I value those people, therefore I’m not only going to publish there, but I will look for their comments. I will look to engage with them. But it has to me a lot less value except - here’s where Google+ has a lot of value. There’s a lot of professionals on Google+. There’s a lot of people that are having a lot of great conversations. So if you join certain groups and you become a part of those areas or those Google Hangouts, as a learning platform, there’s a lot of value. But as far as brands and consumers, consumers are not on Google+. And if they’re there, they’re not there for the brands. They’re there for the education, the learning, the business connections. So to me, brands - to spend time there other than to have themselves, just a spot where they can publish their things to get indexing, I think it’s a waste of their time. Martin: Okay. I appreciate the perspective. Cool. Right. Next. I want to talk about tribes, because you’re talking about Twitter and you’re talking about Facebook. Is your model, because this is really what you’ve given me here Ted. I’m getting a totally different view around a subset I know, but a totally different view on it, so thank you. 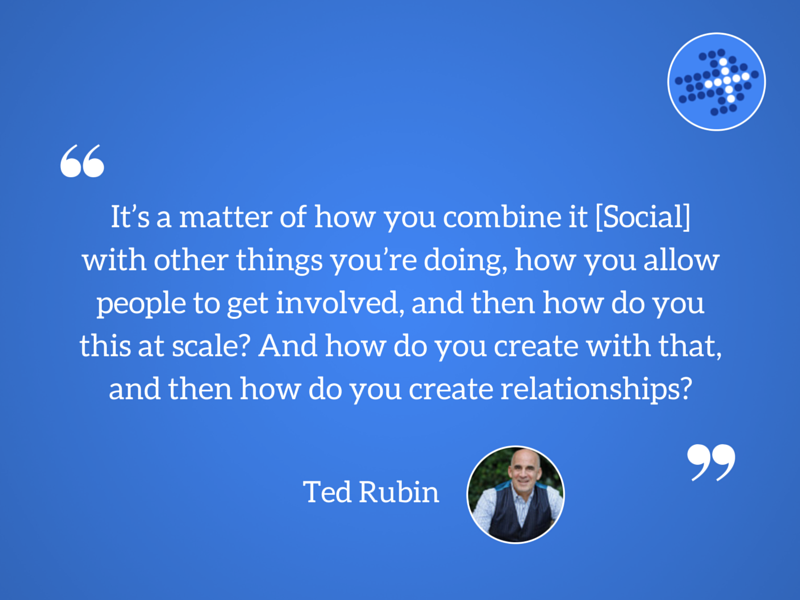 And tribes, not just because of the Seth Godin connection, but because it’s something I’ve talked about on Google+, but do you think that’s how it is on the social platforms. You end up with 100-150 whatever people around. Is that a term that you use at all? Ted: Of course I use the word tribes. It’s not a natural part of my lexicon other than the platform Triberr that Dino Dogan created that I use, which I love. But I think of tribes as communities. So I’m a big believer in community. I like to say that a network gives you reach, but a community gives you power. And tribes are communities. I don’t like to say that’s a limit of how many people can be in a tribe to make it valuable. I think communities can be incredibly large and still be very valuable and supportive. The reason I love communities is a network is just a series of nodes. It’s like LinkedIn, which has tremendous value, but I don’t have a relationship with the person that’s connected to you. I can reach out to you to connect to that person. But to me, a network is a series of nodes. It’s like that old Doublemint gum commercial, that some people in your audience, if they’re old enough, will remember. She had 2 friends, and she had 2 friends, and she had 2 friends, and their faces go across the screen. But in a community are people that support each other, people that are there when they need each other, people that help spread information, that do things for others, that help share your community only because they know that you’re part of their community. And they know that you’ll probably do the same for them. So I love the concept of tribes. I have a lot of tribes. And I try to take my tribes and have them interact with each other. So I’m the guy growing up from high school to college, every job, where everywhere I met at least one person I became good friends with. Very often more than that. And then I would bring all my friends together. So before the days of Facebook, before the days of LinkedIn, all my friends knew each other. And they were from all different walks of life. I have 2-3 buddies who are right now retired NYC cops. They were on the job back in the day. They were friends of my buddies in the military. They were friends of my buddies with different jobs. They all knew each other. And today, they’ll see me down here in FL and people from all walks of life from all over the country will see me and say, hey, how’s Bruce? What’s happening? How’s he doing? Because over the years they all got to know him. So tribes to me, community, doing for others without expectation of anything in return, and knowing they’re going to be there for you when you need it. To me, that’s the heart and basis of return on relationship. Martin: And this is why it’s where can you find that? So you found it on Twitter. You found it on Facebook. For a lot of us, we found it on Google+. And I think that’s the thing. As soon as you get it, but if you’ve got it elsewhere you don’t have to necessarily invest all of the time. But for many of us, and I spoke with others about this, there’s a lot of people that didn’t fit anywhere else and they just built it here. And I was like, that’s certainly how I felt. I kind of missed the boat. Ted: And I agree with you. Again, it’s funny because one day I said something about Google+ and one of my connections on Google+ said, you don’t value us? I said, no, I value you. I don’t see as much value in the platform. But I’m there. I’m interacting. And it all depends on where it works for you. And like I said, it’s a great professionals platform. And like anywhere else, you can create relationships, there, somewhere else, or whatever platforms happen to work for you. Martin: That’s what I love about it. It is about how can you connect with people? How can you have those conversations? And there’s people on the event thread now, so that’s what I think, everyone’s listening. There’s no questions. This is unusual. This is great. Really good company. Ted: And when you think about it, it’s just like where life came from. Some people hung out at the Knights of Columbus in their town. Others hung out at the PTA and that’s where they built relationships. Some people think one place is a lousy place to hangout but others are good. Some people build their relationships at the super market or the coffee shop, so in that respect Google+ of course has value. When I say to me Google+ is not a social place, I’m really talking about the whole brand world. I’m talking about a place where it’s easy to go in, follow what’s happening, and see what’s going on. For me, that’s why I love Twitter. I do like the speed of the feed and the way I can see what’s happening very quickly and get a feed for what’s going on that morning, whether it’s in the world or in a local place. So that’s my feeling there. But again, God bless Google+. I publish there every day. Martin: You hear that? Ted just blessed it. As we move toward wrap up, what tips - I’m going to ask you 2 different perspectives. What tips would you give for 2015 for people looking to build their personal bran? That’s the first one. And the second one is what are the essentials for brands in 2015? Ted: Wow! Okay, for brands again, my feeling is that brands have to start recognizing the value of relationships, the value of what I call looking people in the eye digitally. My book is just coming out. It’s available on all the different electronic platforms. It will be in print hopefully in a couple of weeks. I haven’t officially announced it yet. But it’s called how to look people in the eye digitally. It comes off the Return on Relationships concept. I spoke about it a little bit there. I think brands have to start understanding that does scale. When they talk to people, other people feel that connection, and the value comes there. On the personal level, as far as building a personal brand, there’s a whole bunch of aspects around this. First of all, creating content is easy. People think of it as being hard, because they worry about is it smart enough? Is it deep enough? Is it long enough? Content is as easy as going on Instagram and taking photos, click-click-click, sharing it in different places and mentioning where you were. That’s content. I publish my socks every day or every other day. Martin: I remember your socks. Ted: And it creates conversation. It gives people an easy way to connect with me and start a conversation. So the other thing is realize your content can be used over and over again. I see so many people and brands thinking every time they write something they can only publish it once or in one format. Now, I write blog posts which I syndicate and publish everywhere. They go on a number of different blogs. They go on all my social platforms. I then break them down into paragraphs, sometimes publish them as blogs again, publish them in different places. I turn them into Tweets. I share them again and again. If you’re writing a blog that is evergreen, that is not about a particular event, you can share it again and again. The reason a lot of brands are told they can only use their content once is because agencies want to keep creating more content for them. But if you write something that’s valuable, it goes into the old premises and tenants of marketing. Reach and frequency. Get it out to as many people as you can and get it out to them often so that they see it again and again and again and they understand it. And if it’s not an ad that’s being flashed at them every two minutes, but it’s something of value that’s either teaching them something, giving them advice, or helping them in some area, seeing it again and again is a benefit. It’s not a detriment. So I think you have to syndicate and you have to recognize that you can use your content over and over. I mean, go into my favorites. I share. Whenever I write a Tweet that has value, and I’ll admit - I think most of them do, so I save a great deal of them. Whenever I write a new Tweet that I have not shared before, I save it in favorites so I can go back and use it again and again at a quick notice. And then I save them in spreadsheets. Because to me that’s content I’ve created, no different than a blog post, and I’m going to use them again and again. So that’s my advice to people. And the other thing is find something unique in your life, something you love, something people connect to. It’s got to be authentic. I love funky socks, so for me wearing them every day is an easy day. I wear a vest when I speak. And I see what people relate to. And if they relate to it, and it creates conversation, I do it again and again and again. Martin: Superb. That is awesome. Thank you. I’m going to ask one more question. Where can they find you Ted Rubin? Ted: Well, right now they can find me in Pompano Beach if they want to pop in and have a coffee. First of all, reach out to me any time. My email is TedRubin@gmail.com. My phone number is 516-270-5511. And if you guys don’t know it, you might have seen - this is called. Anybody know what this is called? I think you know, this is an iPhone, a smart phone. Most of you guys have one of these things. And if you have them, you probably know most of them have apps on them. Right? Like you guys probably have apps on your phones. Well these phones come with an app that most of you guys don’t know exists. If you go to it, it has 10 numbers, 0-9. And I’m not sure about in Wales, but here in the States, if you press 7-10 of those numbers, you actually can hear somebody on the phone. It’s magic. Ted: It’s magic. You don’t have to use emoticons to express emotion. You can laugh. You can cry. You can scream. So I’m going to challenge you guys. Pick up the phone every day for the next 30 days and call somebody every day who you haven’t spoken to in a while and just say hello. Ask them if there’s anything you can do to help them. Connect with them. And I guarantee you that scales, because people will talk about it and share. So 516-270-5511. As far as finding me anywhere else, I’m @TedRubin on Twitter. I’m Ted Rubin on Facebook. I’m TedRubinUSA on YouTube. I’m on Pinterest. I’m on Instagram. It’s all under Ted Rubin. Just Google Ted Rubin. The first 2-3 pages is me. I will tell you, though, the only one I’m not is the 97-year-old medal award winner from WWII. That’s not me. And on that note, the last thing I would like to leave you with is always remember relationships are like muscle tissue. The more you engage them, the stronger and more valuable they become. Martin: And that was Ted Rubin. Take care. Ted, awesome. Thank you.